MILWAUKEE (May 22, 2012) - The Harley-Davidson Screamin’ Eagle Factory Flat Track team will roar into action on May 27 at the historic Springfield Mile, the opening round of Grand National Twins competition in the 2012 AMA Pro Harley-Davidson Insurance Grand National Championship presented by Motorcycle-Superstore.com and Lucas Oil. 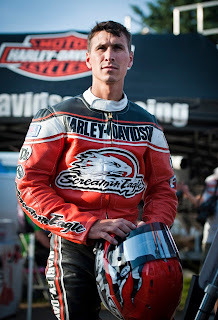 Three-time Grand National Champion (2006-08) Kenny Coolbeth Jr. returns for a seventh season aboard the team’s Harley-Davidson XR750 motorcycles, tuned by veteran crew chief Craig Lager. In 2011 Coolbeth finished the Grand National season in fourth place, with wins on the DuQuoin short track and Hagerstown Speedway half-mile, and two other podium appearances in 20 races. Joining Lager in the pits for 2012 will be former Grand National racer and national-event winner Mike Hacker, owner of the RIDE Academy flat-track training program. Hacker, who retired from racing in 2007, will be filling the role of assistant crew chief and rider coach for the Harley-Davidson Factory Team. The Memorial Day weekend event at the Springfield Mile is a traditional stop on the Grand National schedule. Coolbeth has won three times at the track located on the Illinois State Fairgrounds, which hosted its first motorsports event in 1910. Coolbeth agrees that it will take consistency to win a fourth Grand National championship. The 2012 Grand National Twins schedule includes 11 events on half-mile and mile dirt tracks, including races at two venues not on the 2011 schedule and a return to the popular Indy Mile during the Red Bull Indianapolis GP weekend. The Santa Rosa Mile at the Sonoma County Fairgrounds in Santa Rosa, Calif. (Sept. 30) is a new stop for the Grand National tour. The Grand National series last appeared at the Tucson Half-Mile at Tucson International Raceway in Tucson, Ariz. (Oct. 6) in 2007.